The investigative journalist who revealed the Cambridge Analytica scandal has demanded answers from tech giants about political ads. 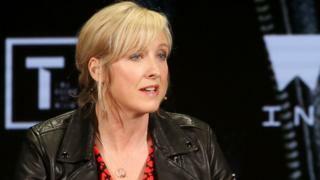 In her TED talk, Carole Cadwalladr called on the executives of Facebook and Twitter to come to the conference and discuss their role in influencing elections around the world. Twitter boss Jack Dorsey is due to speak later this week. TED curator Chris Anderson also invited Facebook to address the conference. Alongside staff of the New York Times, Cadwalladr was named as a finalist for the prestigious Pulitzer Prize for journalism for her work on the Cambridge Analytica story. It involved the discovery that an academic at the University of Cambridge used a personality quiz to harvest up to 87 million Facebook users' details. Some of this was subsequently shared with the political consultancy Cambridge Analytica, which used it to target political advertising in the US. Cadwalladr, who writes for the Guardian and Observer, used her TED talk to directly address who she called the "gods of Silicon Valley". Many of the top executives of technology firms attend the TED conference in Vancouver, Canada. "We are what happens to a Western democracy when elections are disrupted by technology," said Cadwalladr, referring to how voters in the Brexit referendum may have been influenced by online political campaigns. "Technology has been amazing but now it is a crime scene," she added. She said the technology giants had acted as "accessories to spreading lies". She challenged Facebook boss Mark Zuckerberg to come to TED and criticised his refusal to address the UK parliamentary committee tasked with investigating Facebook's role in the Brexit referendum. The Digital, Culture, Media and Sport Committee has suggested that the government makes major changes in electoral law to ensure future online campaigns are more transparent. Cadwalladr said that there were still questions for Facebook to answer. "The whole referendum took place on Facebook and we have no idea who saw what ads, who placed them and what money was spent," she said. "Facebook is on the wrong side of history in refusing to give answers," she added. The BBC asked Facebook for its response but it has not replied. The social network has changed its rules around political ads in the UK, asking anyone placing them to verify their identity and location, and prove who is paying for the advert. People buying the ads must provide their identity by submitting ID, which will be verified by a third party. They must also demonstrate that they have a UK address. After Cadwalladr's talk, TED curator Mr Anderson promised to "hold a space" at the conference for Facebook executives, some of whom he said "were watching". A challenge like this has been met before. In 2014, former National Security Agency (NSA) worker Edward Snowden was a surprise guest at TED, appearing by telerobot from an undisclosed location in Russia. After his talk, a representative of the NSA also made an unscheduled appearance at the conference, offering to be more transparent about its surveillance work in future.